One would be hard-pressed to seek out a children’s author who combines the ability of writing and illustrating as well as Graeme Base. He has an amazing talent for inserting magic into the simplest of ideas, and for drawing dramatic scenes that would not be out of place on a discerning art collector’s wall. 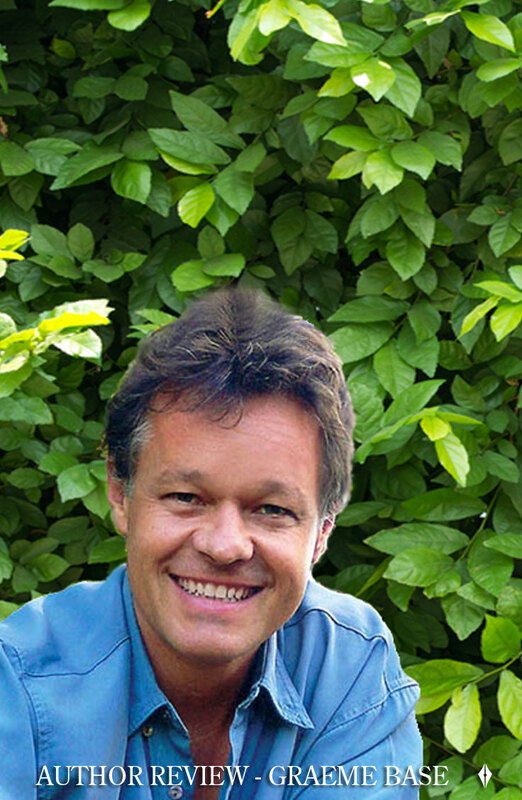 Graeme Base was born on 6 April 1958 in the picturesque town of Amersham in the South East of England. In 1966 (at eight years of age), Graeme moved to Australia with his family after his father secured a job there and settled in Melbourne. Graeme recounts in an interview for ‘Author’ magazine that it was about this time that he wrote a book called ‘A Field Guide to Monsters of the World’ complete with coloured drawings. If there was any indication that Graeme was destined to be an author, it may have been this. Rather than this early work being relegated to nothing more than a child’s cute but ill-informed attempt at writing, it instead formed the basis for his inspired 1996 release – ‘The Discovery of Dragons’. This intriguing tale with exquisite illustrations and inspiring ambience, shares an uncanny similarity to J.K Rowling’s book, ‘Fantastic Beasts and Where to Find Them’, published five years later. Truly the minds of literary masters think alike. 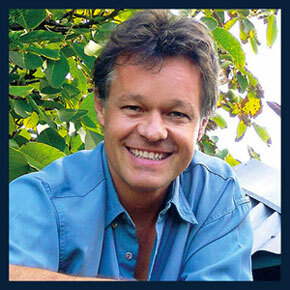 After graduating high school, Graeme spent three years at Swinburne Technical College (now known as the Swinburne University of Technology), from which he obtained a Diploma of Design. As someone who possessed an imaginative mind it was only natural that he would try his hand at various forms of creative expression, including advertising and music. It was during this time that he joined a band called Rikitikitavi (which incidentally is the same name of a short story written by Rudyard Kipling), where he fell in love with the lead singer, Robyn. Their love grew, and they soon got married, although the band fell on hard times with members eventually going their own way. Throughout Graeme’s adventures in full-time work, he continued to draw and eventually found occasional work as an illustrator of other people’s books. 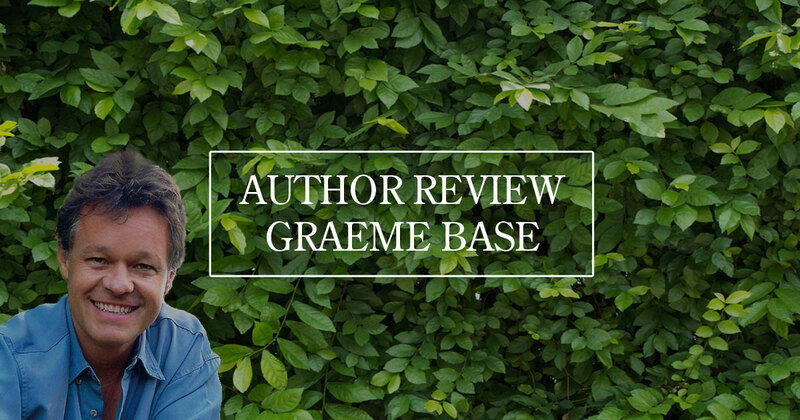 There was only one more step to take for Graeme before he entered the world that would eventually redefine children’s picture books, and propel him from aspiring artist to literary legend. In 1983, Graeme released his first book ‘My Grandma Lived in Gooligulch’, a picture book that both got him noticed and sold well enough for his publisher to encourage him to complete a second book. Three years later, his illustrated masterpiece took the picture book world by storm. ‘Animalia’, an alliterative alphabet book, brought critical acclaim from all corners of the world and launched what had been an enjoyable hobby into an inspiring career. Still his most successful work, the book has sold approximately three-million copies worldwide. * Hardcover editions published by Harry N. Abrams and Paperbacks by Puffin Books unless stated otherwise. Graeme Base also has a number of ‘Little Bug Books’ not included in this list. Even with such success, Graeme continued to push the boundaries of what a children’s picture book could offer. Two years later, in 1988 (Australia’s Bicentenary) he launched ‘The Eleventh Hour’, a book filled with mysteries to solve, objects to be found, and codes to break. It became his second most successful book of all time and firmly secured his place in the literary world, as a master of children’s picture books. Graeme went on to produce many more titles of inspired text and mesmerising illustrations. These include: ‘The Sign of the Seahorse’ in 1992, which saw Graeme discuss the possibility of making the book into an animated film with Steven Spielberg; ‘The Worst Band in the Universe’, in 1999 which included a CD of songs from many of the intergalactic bands in the book; ‘The Water Hole’ (2001), which incorporated a cleverly placed die-cut hole that diminishes as the water dries up; and eventually ‘TruckDogs’, in 2003 which became Graeme’s first foray into the world of children’s novels. It is somewhat of an injustice to pick only three of Graeme’s works and call them notable. In fact all of his books are notable for different reasons. However in the interest of narrowing our selection, we have focused our efforts on what have been his most successful books to date. 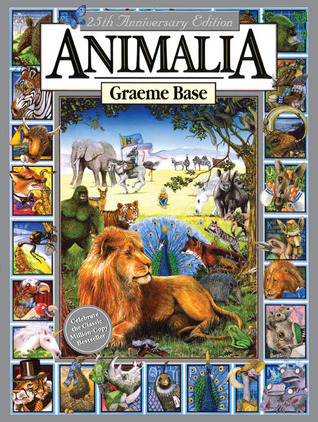 ‘Animalia’ is without a doubt Graeme’s most successful book. Released in 1986, Graeme eschewed the expectation that alphabet books must remain over-simplified and instead created a complex work of art. Highly detailed in each illustration, it is perhaps the most creative alphabet book ever constructed. Utilising quirky alliteration that plays on each progressive letter of the alphabet, ‘Animalia’ is an enjoyable read for children and adults alike (an incredible feat for an alphabet book). It is testament to Graeme’s abilities that he has been able to bring together a tool for education with such impressive creativity. On the whole, the book has received excellent reviews. Many adults today continue to seek out this book for their own children and look back on the illustrations with a fond memory. There are some concerns that the pictures contain themes too dark for an early learning book. However this unique style conveys an intrigue that is rarely seen in modern picture books. Indeed, the current minimalist trend (while positive in its own light) often removes the details and context which lend themselves to gripping a child’s imagination long after the book has been closed. This is not so with ‘Animalia’. In fact, the world of children’s picture books would probably do well to encourage illustrations that shy away from an overly-optimistic and artificially bright world and instead allow themes that occasionally present an atmosphere of a darker (but more magical) world so familiar in the fairy tales and nursery-rhymes of old. There is perhaps much to be said for the idea that happy, hyper-coloured stimulus is better for early development than a darker, more dramatic and earthy presentation. ‘Animalia’ is a picture book that unashamedly stands in the latter category, but in doing so, gives learning the ABC’s a more epic and inspiring context. A book is read, a story ends, a telling tale is told. But who can say what mysteries a single page may hold? Thus begins the illustrated story of a young elephant’s birthday party. What is initially striking about the format and style of this book is that it in fact breaks two commonly held rules, that poems and anthropomorphized animals in children’s books should be avoided. Yet Graeme pulls off both in a clever and entertaining way. Despite ‘The Eleventh Hour’ being his second most successful book, it perhaps remains Graeme’s greatest contribution to the world of children’s literature. Sharing a partial similarity with the famous ‘Where’s Wally’ (which had only been published a year earlier), it raises the concept of a simple object finder into a sophisticated hunt for enigmatic clues and curiously disguised riddles. The power of this book (and what makes it so unique), is that its concepts reach far beyond the simple but imaginative narrative found in so many popular books today. While the power of any children’s picture book lies in appropriate and inspiring illustrations, The Eleventh Hour takes this to another level. In fact, the illustrations often become the driving force behind both the story and the mystery that rises from it. Ironically, this strength is also its weakness. The thrill of the hunt (for hidden objects and clues) can in fact overtake the narrative itself. This effect, combined with the storyline’s dilemma occurring quite late in the book, means that the tale recedes somewhat into the background. This is not to say that the writing is bad, it is far from it. However it remains clear that Graeme is an artist first and an author second. Yet what makes this book so important to children’s literature, is that it does what few books can do. Every page becomes a wonderland for the child to explore. The child even becomes part of the story and is encouraged to take the role of the detective. 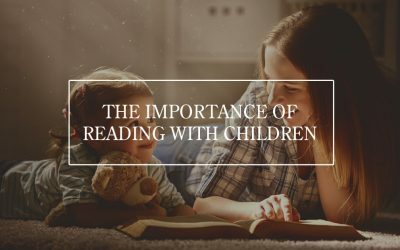 Parents may notice that their child will want to linger on each page for considerable time and for the more artistic child, may even want to delve into the construction of their own story based around the hidden object concept. This of course is the ultimate testament of a good children’s book. When it goes beyond a moment of distraction and enters the realm of encouraging creativity, it transforms from a simple book into a tool of incredible power. The Eleventh Hour certainly has the potential of doing just that. It appears evident in various interviews with Graeme Base, that he has a partiality to this particular publication. This is not without good reason, as this 2001 release offers far more than a simple counting book. 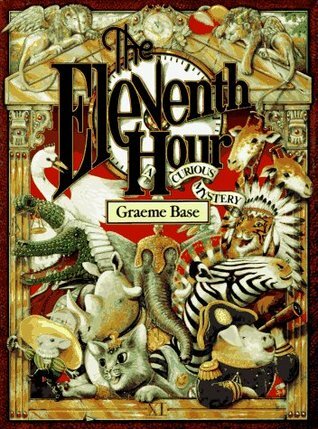 Drawing on the animal themed simplicity of Animalia and combining it with the hidden object concepts of ‘The Eleventh Hour’, Graeme has managed to distil the genius of these previous publications into a beautiful and exciting picture book. The appeal of this book is that Graeme has managed to insert subtle but intriguing educational concepts on multiple levels. This book offers simple counting, the concept of simple subtraction, geography, zoology, ecology and of course the enjoyment of discovering hidden objects. 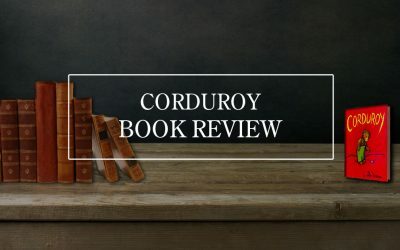 However none of these concepts are forced upon the reader and in fact lay unassumingly in the background, waiting to be discovered by anyone searching for the familiar depth that Graeme often brings to his books. The illustrations of ‘The Water Hole’ may in fact be among his best. Not only does he draw animals and their environments with great care, he has hidden animals in ways that any reader would find incredible. 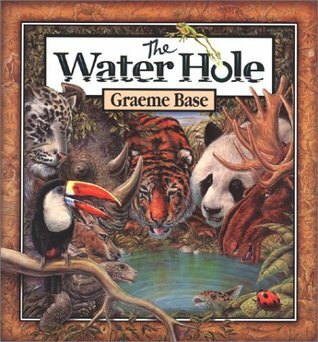 It is no accident that ‘The Water Hole’ remains a popular children’s picture book behind ‘Animalia’ and ‘The Eleventh Hour’. Often authors have a book or two that stands high above their other works. 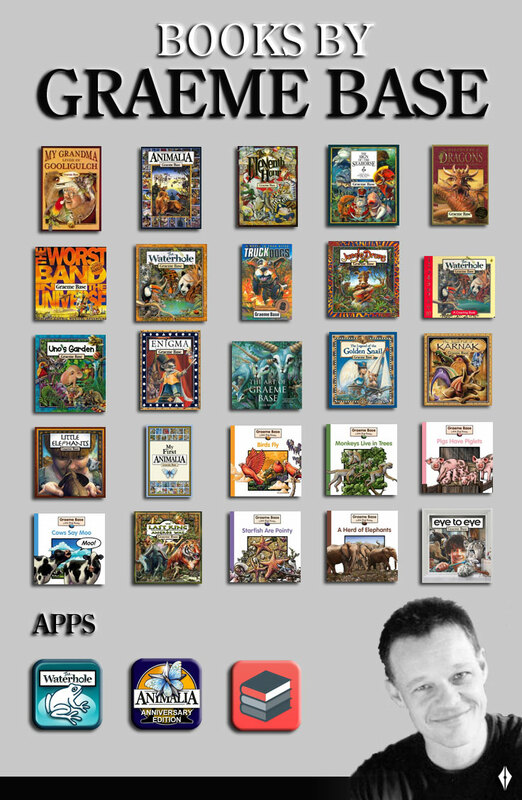 In the case of Graeme Base (despite some of his books receiving more publicity) each of them are unique masterpieces. 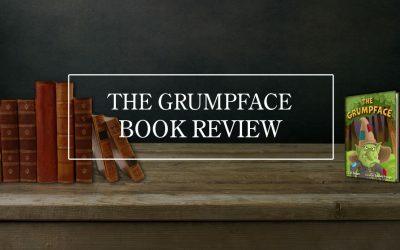 What distinguishes Graeme Base from many of his contemporaries is that he continues to drive himself to push the boundaries of what a children’s book can be. He is well known for writing books that he wants to write, rather than those that fit neatly into pre-defined categories. This gives his books a unique edge that often comes from a place of inspiration rather than commercial viability. In turn this has meant that Graeme has carved out a distinct place for himself in the world-wide market – a commendable achievement that seats him beside other literary pioneers. On top of this, his meticulously detailed illustrations place him among some of the greatest children’s artists in the world. On the whole, Graeme Base remains one of the few children’s picture book authors that deserve to have their complete works on any child’s bookshelf. With his consistently exquisite artwork, parents may find their child captivated for hours as they admire the illustrations, look for hidden treasures and even seek to replicate his genius with drawings of their own. As a talented and meticulous illustrator and writer, Graeme Base is one of the few children’s picture book authors that can truly be counted as a master of his art.